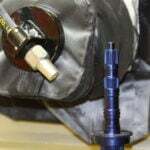 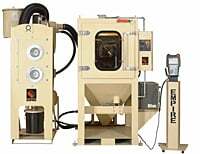 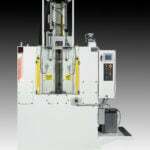 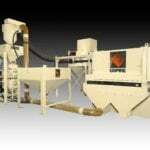 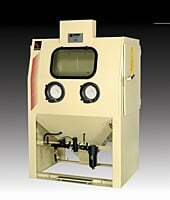 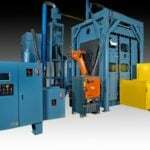 Econo-Finish® Blast Cabinets On Empire Abrasive Equipment Co. 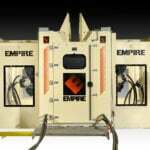 Empire's inexpensive Econo-Finish® blast cabinets feature a unique front-access door to simplify loading of parts, save floor space and speed finishing operations. 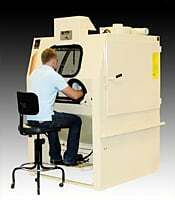 Designed for light-to-medium cleaning and surface finishing jobs, these economical cabinets combine sturdy, 14-gauge steel construction with the features you need to perform a wide range of finishing tasks. 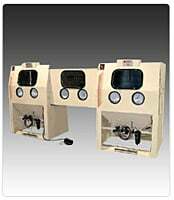 All Econo-Finish cabinets are equipped with a foot-treadle blast control for ease of operation, an external media regulation device, quick-change safety glass and a dust-collection system. 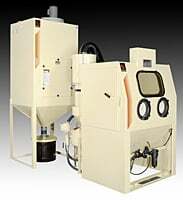 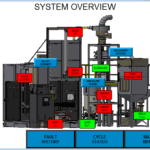 In addition, you can select from upgraded features such as production-quality blast guns, a pressure regulator with gauge, long-life blast nozzles and a high capacity dust collector that extends operating intervals between clean-outs. 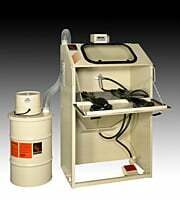 Our DC-16 and DC-30 dust collectors feature a cartridge filter with 16-gallon and 30-gallon dust capacities and built-in silencers. 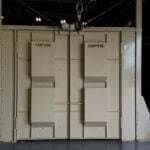 Econo-Finish cabinets are available in two basic configurations: models with two-piece, swing-down and flip-up doors for maximum interior access and an even more economical unit with a swing-down door only. 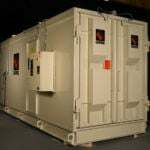 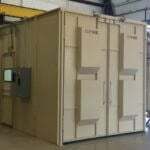 Models with two-piece doors can be specified with a standard upgrade package designed to extend usage and maximize production. 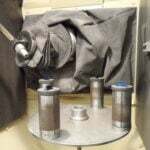 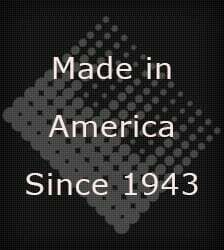 Partial listing of options available for all models: OSHA Safety door switch, Safety matting, Special electricals, Pressure regulator, Air gauge, Di-Carb™ and Boron nozzles.